Our Allentown dentists and team members at Tomko Dental Associates, work with patients to maintain healthy, happy smiles. In most cases, we can prevent advanced oral health concerns before they even begin. Unfortunately, not all tooth decay and damage or cosmetic flaws can be stopped. In these cases, we’ll recommend patients receive cosmetically flawless, metal-free restorations. Unlike the metal and amalgam restoration materials used in the past, metal-free materials look and feel more like healthy, natural tooth structures. If you want to learn more about metal-free restoration options, call our team to schedule your consultation appointment today. Tooth-colored fillings can be used to repair tooth decay and damage or as part of a cosmetic dentistry treatment called direct bonding. Both of these services utilize composite resin, a metal-free restoration material. Composite resin is shaded to blend into the natural smile line, so you won’t even notice where the filling material is placed. Because the putty-like composite can be directly adhered to the damaged or flawed teeth, there’s no need to remove healthy tooth structure, and the entire process is completed in just one visit. The process is simple. We begin by numbing the area to be treated. Then, any damaged tissue is removed, and an acidic etchant is placed onto the surface of the tooth. The etchant creates larger pits and grooves for the putty-like resin to seep into. The tooth-colored composite is then applied directly to the tooth, and it is shaped into position repairing decay and damage or concealing cosmetic flaws. Once in position, a curing light is used to harden the composite in place. The tooth is smoothed and polished, and you leave with a flawless, natural looking smile. 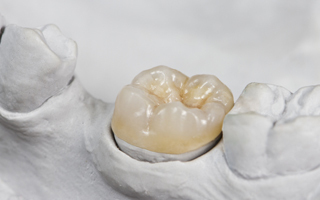 Dental crowns are available in a variety of materials including gold and porcelain fused to metal. While these two options may be slightly more durable, all-ceramic crowns are by far the most cosmetic solution. Crafted entirely from layers of high quality, tooth-colored ceramic, these restorations retain a flawless, natural appearance throughout the life of the restoration. Whether you choose a metal-free dental crown as part of a cosmetic dentistry plan or to repair advanced tooth decay or damage, the process is completed over the course of two office visits. During the initial appointment, the tooth is prepared by removing a small amount of surface tooth enamel to allow the crown to sit on top of the tooth. Then, we capture bite impressions that are used by the dental lab to craft your crown. A temporary is placed to protect your prepared tooth. When we receive your final restoration, you return to our office to exchange the temporary for a custom dental crown.